Usually, at this time of year, the media has a feeding frenzy of Year-End Reviews. For some reason, I’m not seeing many this year. Camile Paglia had an interesting view in her column last week, in the Wall Street Journal. Paglia, a self-described lesbian, wrote an article in defense of men and masculine virtues. It was an interesting article, especially from one firmly entrenched in the left and a feminist. She has had a revelation! Men, and masculine virtues are a necessity if Western Culture is to survive. The rot is pervasive. For example, a church erected a sign saying “Support our Troops”. The sign replaced a faded realtor sign. It wasn’t long someone complained to the county and an order was issued to the church to remove the sign. Why? Supposedly, because the church failed to get the proper permit. The real reason? Hatred for our country and the virtues associated with our military. Paglia believes that trend has gone too far. From Zero-tolerance edicts in education to gender-neutral policies across the country. It is time for that to come to an end. Ms. Paglia, who has been a professor of humanities and media studies at the University of the Arts in Philadelphia since 1984, sees her own students as examples. “I have woodworking students who, even while they’re in class, are already earning money making furniture and so on,” she says. …men, and especially women, need to be honest about the role biology plays and clear-eyed about the choices they are making. Yes, it’s a long article. I did trim it a bit. If you wish, you can read the entire article at the WSJ website. All is not lost, however. We still have young men, and women, joining the military, engaging in traditional roles, trades, acquiring skills that provide role models for the younger ones. There is a revolt, in states across the country against Common Core and it’s emasculating agenda. The opposition against Common Core falls along philosphical lines—the liberals and the NEA are for it, families and those concerned about education that actually teaches instead of indoctrinating students with liberal agendas, are against it. I saw this piece on the IBD website and it stuck a resonant note. I’m not all that much of a Glenn Beck fan. I think he’s a bit too strident. What he says, however, I’m in complete agreement. He speaks those thoughts that many think but are unable to articulate. As I listen to him, mostly when my wife does—she prefers to listen to him than Laura Ingraham, I’m reminded of the mannerisms of an old time evangelist. Beck makes no apologies for his religious beliefs. That is another facet that enrages the left. Beck has beliefs. He speaks those beliefs. He cares not if he offends any liberal’s sensitivities. After all, they don’t mind offending us, why should we give a courtesy that we don’t receive in return? The libs in the media called Beck’s 8/28 gathering a Tea Party and a political event. How wrong they were. While it had political overtones, it was a celebration of the core values of our country. Values the libs cannot accept. Here’s IBD’s views on the gathering. Grass Roots: The president says he didn’t watch any of Glenn Beck’s “Restore Honor” rally on the National Mall. That’s not surprising. Democrats and the White House haven’t been listening to the people for awhile. He dismissed this crowd just as he and his party dismissed the “angry mobs” that descended on health care town meetings wanting to know why their government no longer wanted to hear their voices or seek out the consent of the governed. Those people were also said to have been “stirred up” by political opponents and conservative talk radio. This genuine grass-roots movement was dismissed as “astroturfing” by House Speaker Nancy Pelosi and others. But their anger did not have to be manufactured. It was a quite natural response to a government that is bankrupting their children and grandchildren as it spends money we don’t have on things that don’t work. “Mr. Beck” didn’t manufacture the people on the Mall. He merely has given them a voice and a focal point, and a reminder that we are endowed with inalienable rights from a higher authority than any gaggle of senators and representatives. 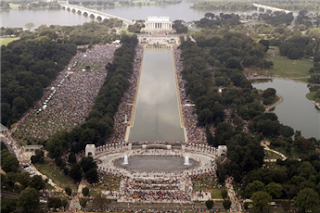 “We the people” assembled on the Mall, not an angry mob stirred up by rabble-rousers. The movement that met on the Mall and had coalesced into what became known as the Tea Party comes from different parties and, despite what the so-called mainstream media say, different ethnic groups and nationalities. They have one thing in common: They are tired of being ignored. They are opposed to the kind of arrogance that convinces a president that maybe he just didn’t make himself clear enough and he only needs to make more speeches in a perpetual campaign to get it through our thick skulls. It is the kind of arrogance that Pelosi demonstrated when she said we’d have to pass health care reform to find out what’s in it and that government needs to intervene between a patient and a doctor. People are tired of votes bought through Cornhusker kickbacks and bills written behind closed doors that are voted on without being read. The Democrats push health care that Americans don’t want by overwhelming numbers. The feds sue the sovereign state of Arizona over the wishes of a majority of Americans that want secure borders. Then the secretary of state slams Arizona, citing SB1070 as a human rights violation to the United Nations. The American people see the disconnect between “saved” jobs and near double-digit unemployment. They are weary of a government so out-of-touch that once again we seem to have taxation without representation. They see a government making war on job-creators, punishing success and rewarding failure, redistributing wealth while creating none. They see an energy policy that produces no energy in order to save a planet that is not in danger. Ignore that crowd on the Mall at your peril, Mr. President. That “certain portion” of the people grows bigger every day and by November your party may lose big in all 57 states you campaigned in. “Ignore that crowd on the Mall at your peril, Mr. President.” Please. Please continue to do so. At least until after the elections in November.